The Libyan–Egyptian War, a short border war between Libya and Egypt over political conflicts, ended after the combatants agreed to a ceasefire organized by Algeria. Mediation by Algeria and Palestine Liberation Organization leader Yassir Arafat finally led to a ceasefire. Egyptian President Sadat gave his forces instructions to stop all attacks on 24 July 1977 and agreed upon an armistice. Egypt will open a Gaza Strip crossing for humanitarian and medical aid. Egyptian President Hosni Mubarak ordered the opening of the Rafah Border Crossing. Food and medical supplies will be allowed, but not concrete or steel. It will be made available for ill and injured Palestinians seeking medical treatment. 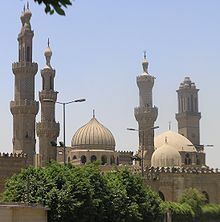 Muhammad Sayyid Tantawy, Grand Imam of al-Azhar Mosque in Cairo, dies at the age of 81. Tantawy died on the morning of March 10, 2010 as result of a heart attack during a visit to Riyadh, Saudi Arabia. Tantawy died as he was about to board his return flight to Egypt at Riyadh’s King Khaled International Airport.